After payment for your profile, you will receive immediately a PDF file with a description of the strategies that you should use for enhancing your communication skills. This will include detailed information tailored particularly to the preferences you have chosen in the questionnaire. In effect it will describe the impact of your VARK preferences on important decisions in your education or career. You will also learn about strategies that should not be used and the characteristics of other learners who may have similar preferences. The profile will allow you to make effective choices and may reveal inappropriate methods that you have been using. Each profile is usually 7-8 pages in length depending on the VARK scores provided. The various sections of the profile are shown below.). Section A: The profile begins with some general points about what VARK indicates and what it does not. Not all are shown here. VARK is not a definitive measure. With only 16 questions it indicates your preferences for the ways in which new learning is “taken in” and expressed. 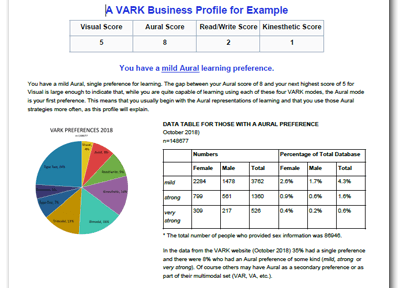 VARK provides information about your Preferences which may not be the same as your Strengths. Although you may be a skilled artist you may not choose “visual” as your way to learn new information. Similarly there are skilled athletes who prefer not to learn using their kinesthetic mode (K) although they will use that mode extensively when performing/playing. Nobody works in a single mode and very little of our communication is possible in a single mode. e.g. Those who have a single preference have a number of stances. They may choose to use only their preferred mode for making major decisions and for learning. They say they are indecisive and confused when information comes to them in other modes. Having made their decisions using just one mode, they may be less confident that it is the “right” one than those who have used many modes to check their understanding. etc. Your Aural/Oral preference is very strong. Your score of 12 is well ahead of the other modes. In our April- June database, only 3% of respondents were in the same category as you – with an Aural preference – and yours is Very Strong. Others may have Aural as a secondary preference or part of a multimodal set of preferences but those who are mild, strong or very strong in their Aural preferences are a small group. etc. The most recent graph of preferences and a table showing percentages with a similar profile to you are inserted here. Section E: Strategies for communicating with your particular preferences. Section F: How to use your preferences when communicating and working with others. Section G: A case study of someone with a similar profile. Section H: The profile ends with the appropriate Business oriented Helpsheet(s).